John Lee Dumas. You’ve probably heard the name since he has one of the most popular business podcasts in the world, Entrepreneurs on Fire. But did you know he has also led the sixth most funded publishing campaign and the second most funded journal on Kickstarter ever with his launch of The Freedom Journal? Amazing. 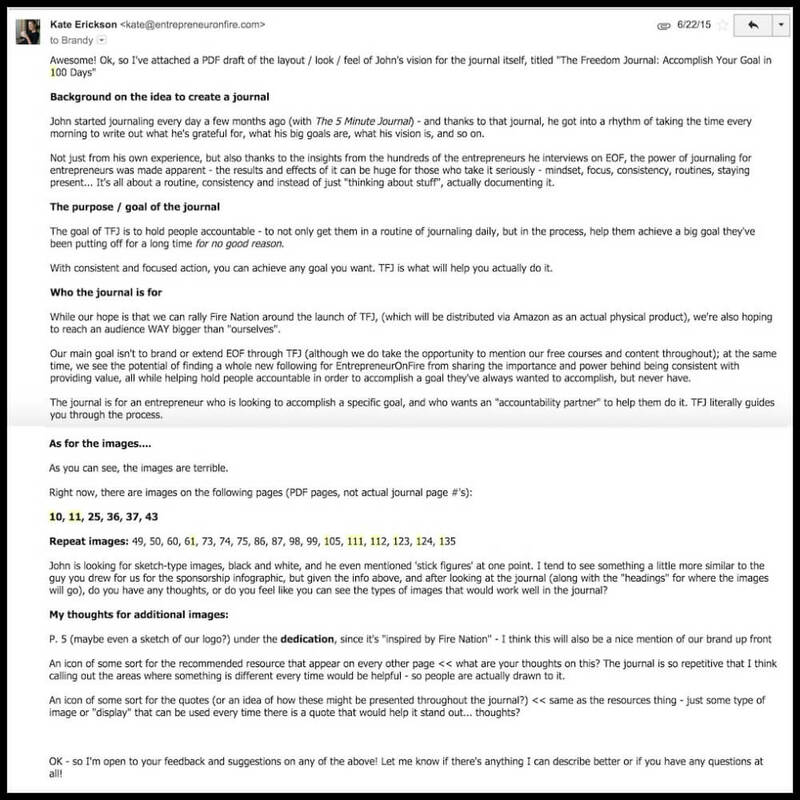 Because of the Kickstarter success John Lee Dumas has had, I knew that one day I’d ask him for advice on how he did all of that. Well, that day has come, and I’m excited to have John (and Kate too!) share their knowledge publicly here in a guest post on SPI to help me and anyone else thinking about going down the crowdfunding route with their new product idea. Take it away, John! In January 2015, I had an idea. But, as you know, entrepreneurs have a lot of ideas. This idea, however, was different. I knew this idea was different because my audience, Fire Nation, told me so. Fire Nation played a very critical role in the success of my idea, as you will see throughout this guide. At the time I’m writing this, it’s been eighteen months since I launched my idea on Kickstarter, a crowdfunding platform for a vast range of projects. My Kickstarter campaign ran for thirty-three days, and since the launch I’ve made over $1 million in revenue. 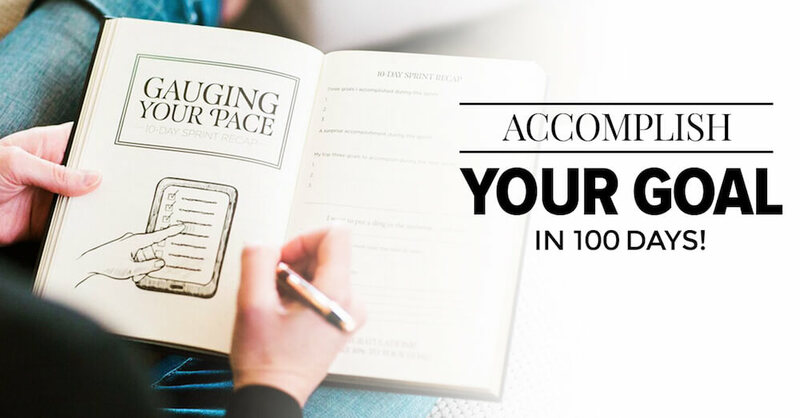 To create a hardcover journal called The Freedom Journal: Accomplish Your #1 Goal in 100 Days. To generate revenue so they can create their concept (they don’t have funds to cover what it would cost to create it). I already had both of these things: an audience and the funds to create The Freedom Journal on my own. But I knew there had to be more behind why one would choose to launch on Kickstarter. People trust the Kickstarter platform, and I know that, like Amazon, if backers are unhappy with their decision, they have a simple way to request and receive refunds directly through Kickstarter. 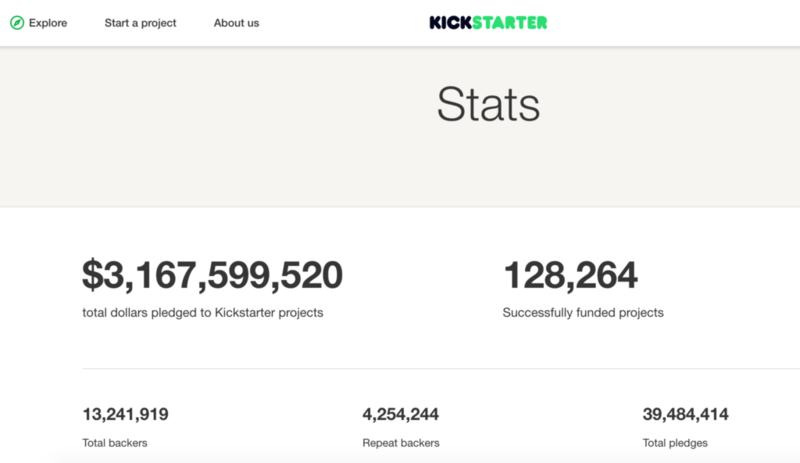 “Backers” are the individuals who support a project on Kickstarter. I knew Kickstarter’s reach would go way beyond what I could muster on my own. There are A LOT of people who would probably never find me or The Freedom Journal on their own. 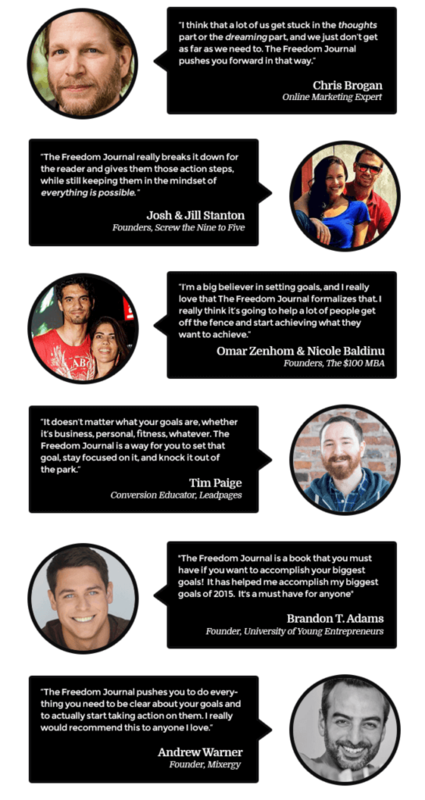 With the help of those who discovered The Freedom Journal on the Kickstarter platform, the campaign had a great opportunity to receive a lot of word-of-mouth marketing. I wanted this launch to be BIG. Instead of re-creating the wheel with an entire product suite, I would be able to offer multiple things in one place. It wouldn’t just be me on this journey alone. Kickstarter provided a platform where I could create community around The Freedom Journal. Fun Fact: I have accounted for .0023 percent of the total dollars pledged to Kickstarter projects. Of all of these numbers, the one that really got me is the Repeat backers statistic: well over four million people revisit Kickstarter and pledge to multiple campaigns. That’s a lot of people coming back to Kickstarter to search for campaigns. Turns out I was right about there being more behind why one would choose to launch on Kickstarter. Each of the reasons why I chose to launch on Kickstarter contributed to $453k in revenue in thirty-three days and The Freedom Journal becoming the sixth most funded publishing campaign of all time. 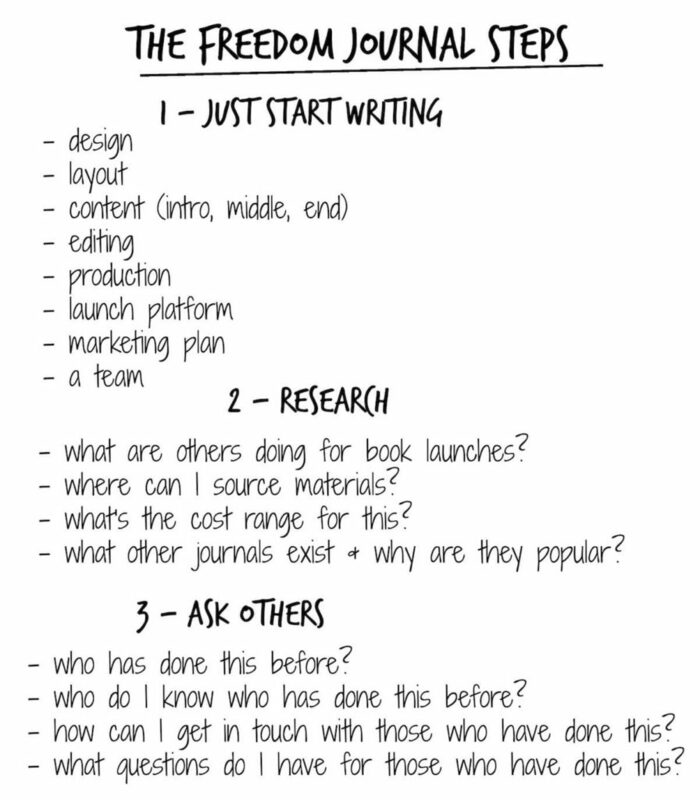 Throughout this post I’m going to share the step-by-step approach my team and I followed to launch The Freedom Journal on Kickstarter. That way, if you’re thinking about doing your own launch, you’ll know exactly what to do. You can think of this like your own guide to launching on Kickstarter! But before we dive in, I want to be sure to make one thing crystal clear: launching on Kickstarter is no small feat. It takes time, planning, patience, and a lot of work. The great news is that it’s totally worth it! As is true with any big project, breaking down the steps you need to take in order to accomplish your goal is important. Every project—no matter how big or small—starts with an idea. While this phase may seem like a minor one, it’s actually the most important: this is the foundation of your entire project and requires special attention. Get this phase wrong, and it’s going to be very difficult—and nearly impossible—to make your launch successful. Let’s do a deep dive into each of these steps. If you’re interested in learning more about launching on Kickstarter, chances are you already have an idea in mind. Whatever your idea may be, an important piece of the puzzle is making sure it’s something you’re passionate about. As I mentioned earlier, launching on Kickstarter takes time, planning, patience, and a lot of work. So if you’re going to put a ton of work into launching your idea on Kickstarter, you want to make sure it’s not something you’re going to lose interest in six months or a year from now. But to give you an idea of the timeline, it took me about one year from the moment I had my idea to create The Freedom Journal to actually launching it on Kickstarter. 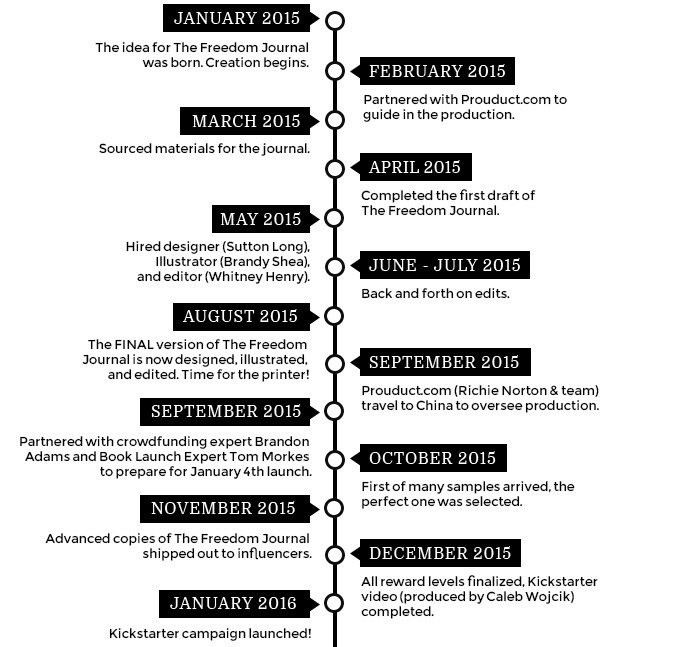 Note: I used this image of my timeline on my actual Kickstarter page to help tell the story of The Freedom Journal and how it came to be. We’ll be getting into everything that’s required to create an engaging Kickstarter page later. Your timeline will likely vary depending on how you’re approaching your launch on Kickstarter. For example, maybe you’re going at it in more of a traditional sense, meaning you aren’t going to actually create your concept until your campaign is done and it’s a success. If that’s the case, I would still plan on your pre-launch period taking anywhere from three to four months. There are A LOT of moving pieces! Once you’ve decided what it is you want to create, it’s time to dig in and confirm you’re on the right track. I strongly believe there is power in putting your idea out into the world. It not only makes the idea real, but it cements accountability. Once others know about your idea, they’ll continue to ask about it, which can serve as important accountability for you along the way. When you know others will be asking you about your idea, you’re more likely to continue making progress. Talking to others about your idea will also help you solicit feedback. Naturally, when you share an idea with people, they want to give you “their take.” Some of the feedback may not amount to much, but keep your ears open for recurring themes and any confusion that might come up over and over again. The questions you receive from those who you’re sharing your idea with can result in clarity, which means you’ll be able to talk more clearly about your idea, your mission, and your end goal. But don’t just take the feedback you receive at face value. Actually use the feedback you receive to become more curious about your idea and how it fits into the marketplace or industry you’re in. 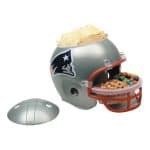 What other products already exist that are similar to my idea? How do the creators market to, sell to, and engage their audience? How will my idea stand out in a unique way? Putting your idea out into the world is your stake in the ground. You’re making it real, you’re gaining valuable feedback, and you’re researching what else is out there. A combination of these things will result in a crystal clear understanding of your goal. As a direct result of putting my idea out into the world, I not only accomplished everything above, but I also connected with three key team members who I couldn’t have launched on Kickstarter without—all just from talking about my idea. But we’ll dive deeper into the Hiring Phase in just a minute. It’s incredibly difficult to start taking steps toward accomplishing your goal if you’re not crystal clear on what that goal is. You have your idea, and you’ve shared it with others, gathered feedback, and done some research. Now it’s time to write it out on paper. Given everything you’ve learned about your idea and what it is you want to create, what is your S.M.A.R.T. goal that will help you make it happen? Take fifteen to twenty minutes to actually write out your S.M.A.R.T. goal. Having this in place will serve you over and over again on your journey to launching on Kickstarter. You have your idea, you’ve gathered feedback and done your research, and you’ve formulated your S.M.A.R.T. goal. Now it’s time to get proof of concept. In most cases, getting proof of concept means you’re sharing an idea and then asking your audience to pay you money for it. 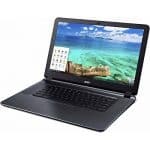 The saying, “people speak with their wallets” is SO TRUE. However, depending on how you’re approaching your launch on Kickstarter, your strategy for getting proof of concept might vary. For me, getting proof of concept came in the form of an interest list. Remember in the very beginning of this post when I said that Fire Nation played a very critical role in the success of my idea? Well, I say that because Fire Nation actually gave me my idea. I launched my podcast Entrepreneurs On Fire in September 2012. Since that day I’ve continued to provide my audience with free, valuable, and consistent content (to the tune of over 1,700 episodes published to date!). As a result, I’ve grown an incredibly loyal audience, Fire Nation, who turns to me to ask questions, share their struggles, and celebrate their wins. Their ability to set and accomplish goals. Because I had heard this same question thousands of times, I knew the answer was incredibly valuable to my audience. Otherwise, that same question wouldn’t have come up over and over again. That was my first proof of concept: my audience needed help when it came to setting and accomplishing goals. But I knew this first piece in and of itself wasn’t enough for me to go and invest thousands of dollars in such a huge project. And so I set up a landing page where I shared my idea for The Freedom Journal with Fire Nation, and I asked them on that page to sign up for an interest list if they wanted to learn more. Nearly 10,000 individuals entered their email address, giving me a rather LARGE proof of concept— enough to call it ready to move forward. That’s when I set my S.M.A.R.T. 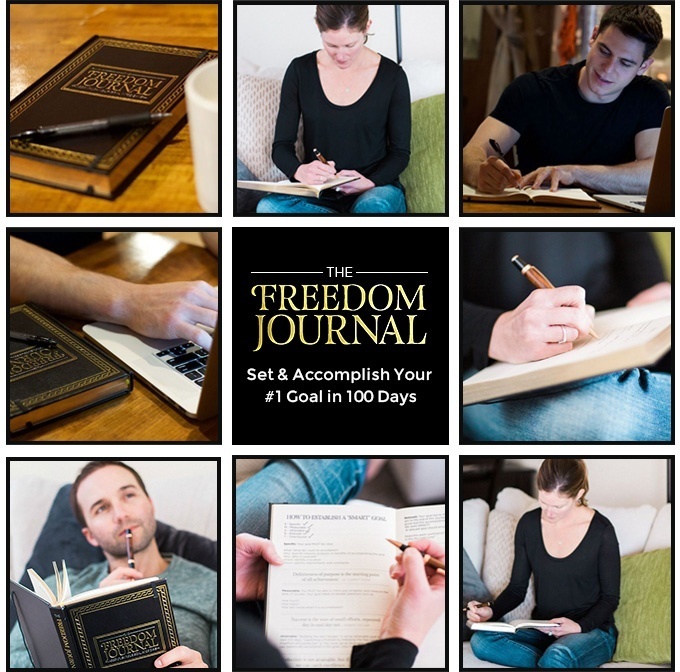 goal to launch The Freedom Journal on Kickstarter in January 2016 and to have 10,000 copies printed and ready to ship. Sound like a familiar “idea validation” process? That’s because it works, and countless successful entrepreneurs will back me up on this—Pat Flynn included. Next up comes The Brainstorming & Planning Phase. Whew! We know this is a lot of info to take in, and we’re just getting started! If you’re enjoying the content and interested in joining our free course on How to Launch on Kickstarter, be sure to grab your spot here. The Brainstorming & Planning Phase is where you’ll start to put the many moving pieces and steps you need to take together. As you create your plan, you’ll also be setting critical due dates to help you reach your goal. Take out of a piece of paper, and just start writing. Write out every step you know you need to take (or think you need to take) in order to accomplish your goal. This not only involves brainstorming on your own, but also researching and reaching out to others who you know have already been where you want to go. Sometimes all the steps you need to take to successfully finish a project or reach your goal won’t be completely clear, or even obvious. And sometimes you might think you have all the steps down, but then extra ones start popping up here and there—things you simply didn’t think about. The most important part of the brainstorming process is that you’re gaining as much knowledge and insight about the steps you need to take as possible. This will prevent you from being massively surprised along the way. Now that you have at least some of your steps and ideas out on paper, continue on with your research and ask questions to those who have already been where you want to go. Once complete, it’s time to start creating your project plan. Your project plan is at the core of everything. It will include individual deliverables, dependencies, and deadlines that will ultimately help you reach your goal on time. This is also an important time to really dig into what your budget will be for your project. Starting with all the knowledge and insights gained during your brainstorming process, begin to lay it all out. That might mean writing it out on paper, documenting it in an Excel or Google spreadsheet, or inputting it in your favorite project management software (I love Asana for this). The goal is to get everything in one place, in a logical order, with due dates attached. Again, it’s okay if you don’t know ALL of the steps right now. In order to get started, you just have to know the first step. Another critical part of the Brainstorming & Planning Phase is figuring out what type of help you’ll need along the way. Now that you have your plan laid out, you might see there are a lot of steps you’re not really sure how to execute. Whether it’s that you’ve never done them before, it’s not in your “wheelhouse” to do them, or you simply don’t want to do them, there will be a number of things you’ll need to delegate. Now is the time to identify those things, because as you start to execute your plan, you’ll be moving quickly into The Hiring Phase. The Hiring Phase is where you get to step into your project manager role and start delegating! Perhaps you have someone else who is managing this project for you, and if so, they should pay close attention to this phase. Also, keep in mind there will likely be new steps that come up along the way, ones you didn’t anticipate or know about before. Therefore, hiring your team may not be a single event, so be prepared to be fluid and quick on your feet if a new team member is necessary. Otherwise, your project could be delayed. This is an EXCITING phase, because once you hire your team, it’s full speed ahead! 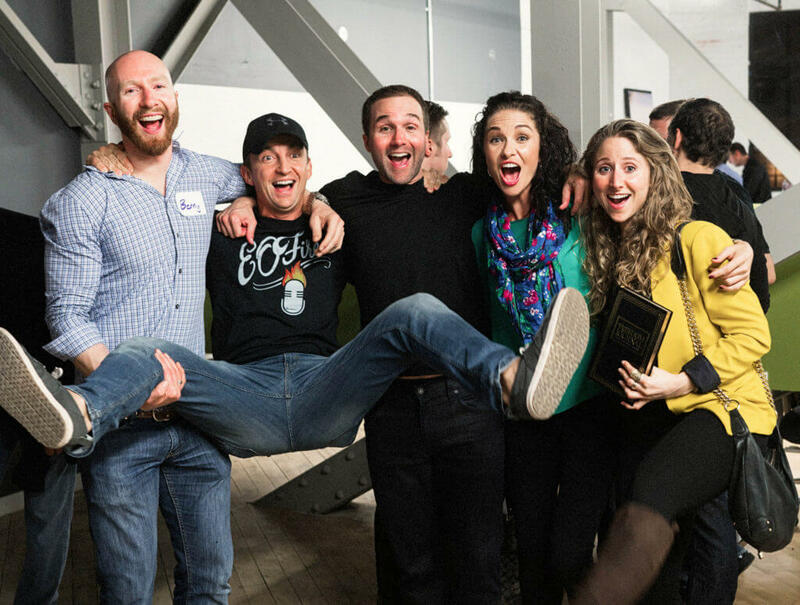 My Hiring Phase ended up being very linear, and I was incredibly lucky to come in contact with the BEST of the best. But it wasn’t easy. The Freedom Journal project started out strong with the help of my partner Kate, who took on the project manager role. Once I had Kate on board to help me oversee all the moving pieces, it was time to take the first step toward creation. This is about the time we were introduced to Sutton Long, who took all my messy notes and sketches and put The Freedom Journal together for us. This introduction came as a result of me reaching out to those I knew in the industry who had recently published a book. Who better to ask about this step of the process than someone who had just been through it? As Sutton was putting The Freedom Journal together, we quickly realized that illustrations and an actual book cover would be necessary. This is where our designer, Brandy Shea, who we have on retainer here at Entrepreneurs On Fire, came into the picture. Note: if you do end up hiring externally for the design aspects of your project, be sure you’re explaining in detail exactly what it is you’re looking for. If you find it difficult to describe, or you’re not really sure what you’re looking for, do some research. Find other examples and styles of products, pages, and layouts that you like, and share those with your designer. Luckily, Brandy is very familiar with our brand. 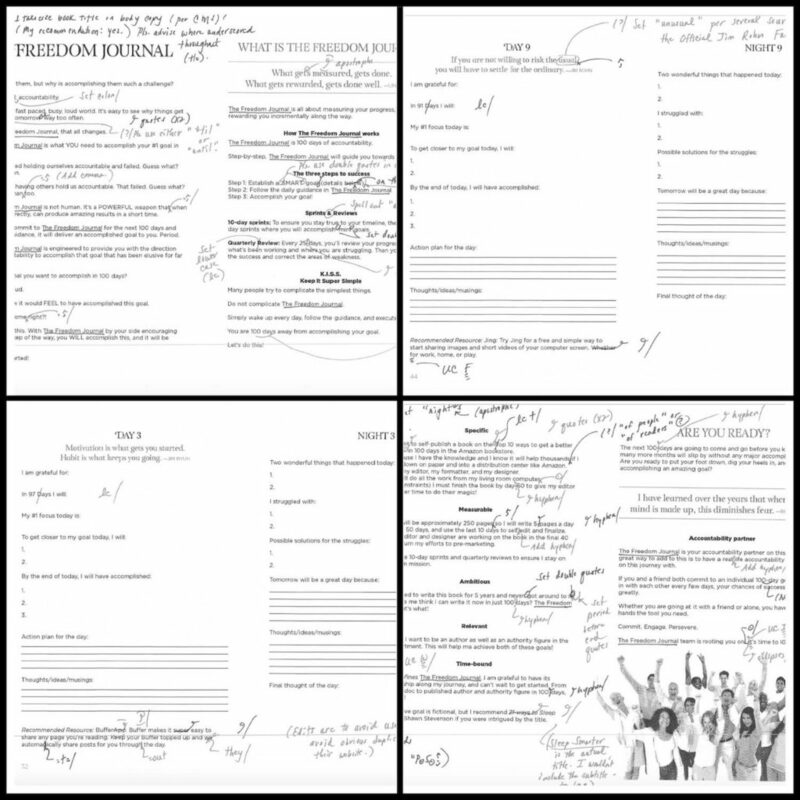 Once we had the design aspects of the project underway, Sutton started sending us final revisions of The Freedom Journal. It was at that point Whitney Henry, our editor, came into the picture. What originally started out as a step we were going to manage in-house turned out to be a massive—and integral—piece to delegate. 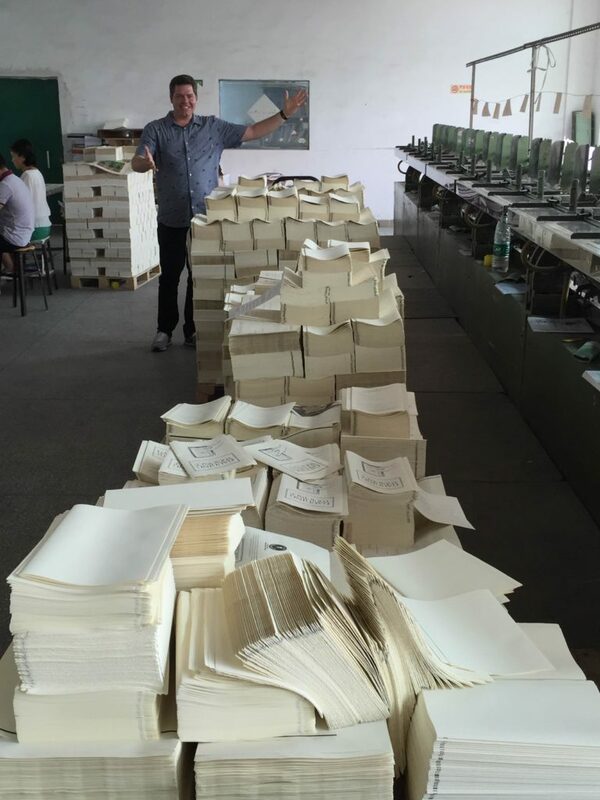 After all, we were printing 10,000 copies of The Freedom Journal, making a single mistake equal to 10,000 mistakes. Luckily, we didn’t take the risk of editing in-house! Now we had the journal put together, illustrated, and edited, it was time to find someone who could help us print it! Turns out I had recently interviewed Richie Norton on Entrepreneurs On Fire, who does product creation through his business Prouduct. You can also check out Richie’s interview right here on Smart Passive Income. As the creation fell into place, we turned our attention to finding team members who could help us market and launch it. Tom Morkes, who helped us put together our entire outreach plan (a massive part of our marketing strategy), reached out to me after hearing me talk about The Freedom Journal on Entrepreneurs On Fire. With his expertise and background in helping others launch best-selling books, I was sold. And Brandon T. Adams—our crowdfunding expert—was someone I found during my brainstorming. He proved priceless to the success of our launch given his knowledge and expertise with crowdfunding platforms. But what if I don’t have the means to hire a team? I’m glad you asked, because when you’re first getting started you don’t always have extra funds lying around. In this case, it’s time to roll up your sleeves and do the work! While you may not have experience doing everything required to meet your launch goal, chances are others in your community do. Jump into the Facebook Groups you’re a part of, or reach out to those who you’ve built relationships with in your industry or niche, and simply ask for help. If you’ve been good about building your community and always providing value, you’ll have no trouble finding people who are willing to help—even if that means your friend reaching out to another friend for help. One of the greatest strengths you can have as an entrepreneur is being resourceful. 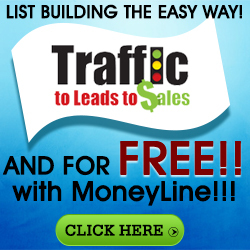 Leverage the incredible access you have to the internet to do some research! 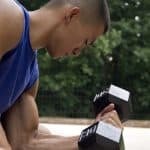 Chances are there are articles or YouTube videos that can help you along the way with the steps you’re not too sure how to accomplish. And if you get stuck—like there’s just no getting around a certain roadblock—find a way to go over it instead. Some other things to consider if you’re managing your launch on Kickstarter solo: productivity, discipline, and FOCUS! Yes, it is going to be a lot of work for one person to manage; and yes, it is possible. Once you have your plan and your team (even if that’s just yourself) in place, the only step left is to move into The Marketing & Launch Phase. The marketing strategies you choose and how you approach your launch will vary depending on what your current foundation (if any) looks like. For example, if you don’t have an audience, reaching out to them wouldn’t be an option. Likewise, if you don’t have a big budget, advertising might not be a main focus for you. Set up shop on your launch platform (e.g., for me, that was Kickstarter). Create a communications plan (i.e., how you’re going to get people there). There are going to be a lot of moving pieces and important deadlines to hit during this phase, but there’s no time to panic. Keep your project plan close (and your project manager even closer). Before I dive into some of the key marketing strategies used throughout The Freedom Journal campaign, let’s talk about how to setup your Kickstarter page. As is the case with everything you create in your business, including your business itself, you have to be able to clearly talk about and present what it is you have to offer, who it’s for, and why they should care. This is critical to the success of your Kickstarter campaign, and it all happens on your Kickstarter page. This advice came straight from our crowdfunding expert Brandon. You know you need a great video, a great design and layout, and a great story to engage your visitor and make them want to learn more. But, of course, it’s not just as simple as slapping a few images together and talking on the mic about why you’re on Kickstarter in the first place. Telling a great story includes giving your audience an opportunity to identify with you, in addition to sharing a compelling reason why they should care. What can your idea do for them? For me, that started with sharing the power of setting and accomplishing goals. First, I hired a video guy, Caleb Wojcik, to create the video. Knowing how important this aspect of the Kickstarter page would be, I didn’t want to take any chances. Caleb helped me storyboard the flow of the video, which quickly became our guide for the overall story we were going to share on The Freedom Journal Kickstarter page. Once we had a storyboard to follow, it was time to press record. In the video I not only explained what The Freedom Journal is, I also shared where I was personally before and after setting and accomplishing one big goal. I then made a promise to anyone who chose to back The Freedom Journal: The Freedom Journal won’t let you fail in setting and accomplishing your #1 goal. Check out our Kickstarter video and notice how I give you an opportunity to identify with me as an individual, in addition to sharing a compelling reason why you should care (i.e., what The Freedom Journal can do for you). You can also check out this behind-the-scenes video from Caleb where he talks about the process of creating the video for The Freedom Journal campaign. So we had our video, which is incredibly powerful, but to take it a step further—so viewers weren’t just hearing the story from me—we also reached out to other industry experts and successful entrepreneurs and got their take. We asked them how setting and accomplishing goals has impacted their life and where they are today. Each of the images below was clickable and led to a video of these individuals sharing their journey as it relates to goal-setting. With the help of things like this image and the videos that accompanied it, every section of The Freedom Journal Kickstarter page shared another part of the story. Remember to keep this in mind: once you have your story and your video, it’s time to implement layout and design of your Kickstarter page in a way that helps you continue to visually communicate that story. First tip when it comes to the overall layout and design: make it easy for visitors to consume. Second tip: maximize the space available. In terms of maximizing your available space, you can play around with different layouts and collages that help you tell more of your story in less space. Here, instead of just putting a single image of The Freedom Journal on the page, we’ve communicated a whole lifestyle that the visitor is now associating with owning the Journal. And finally, a quick time-saving tip for your layout and design: mock up your design beforehand in a program like Photoshop so you can make tweaks and changes outside of the Kickstarter platform. Once you’re happy with the overall layout and look, then you can format it in Kickstarter. This will make the implementation of your Kickstarter page design a lot easier—and quicker. Will I get featured by Kickstarter? Of course the hope is YES! But you have to be realistic. There are thousands of campaigns launching on Kickstarter at all hours of the day, seven days a week. The chances of being featured are quite slim, and unfortunately there isn’t a guide on “how to get featured” (although there are certain things people suspect can help). Case in point: we had a crowdfunding expert on our team and followed every step he recommended. Our trajectory and the consistency of our campaign was very good. Plus, we hit our funding goal of $25k in less than three hours. But even with the success of The Freedom Journal campaign, we were never featured by Kickstarter. Interestingly enough, one year later we launched another journal on Kickstarter called The Mastery Journal: Master Productivity, Discipline and Focus in 100 Days. We were not only featured by Kickstarter and listed under “popular campaigns,” but we were also marked as a “Project We Love” for almost the entirety of our campaign. Same exact process, different results. 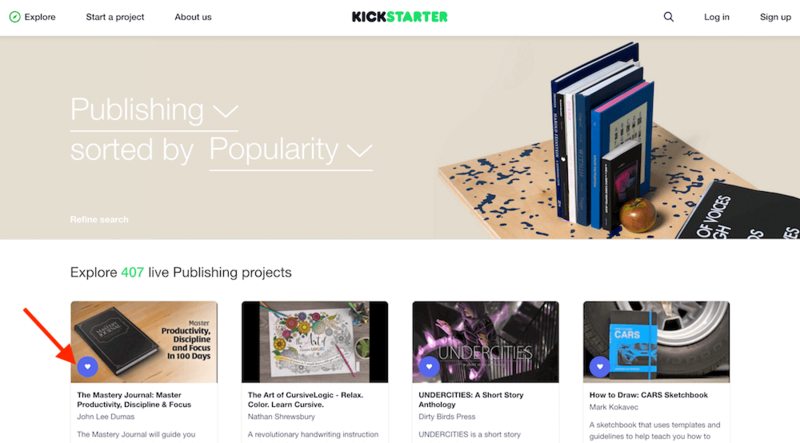 Now that you have a beautifully crafted and engaging Kickstarter page with all the main elements, let’s talk about the strategies you can use to get people there! At the time, I had interviewed nearly 1,200 successful entrepreneurs, many of whom I went on to build great relationships with as a result of having them on my podcast. My big ask to them? My ask was of course a lot more detailed than this, but I essentially described what I was creating, gave them a “sneak peak” at the final product, and let them know how I felt this could benefit their audience. This involved everything we were doing with our own content here at Entrepreneurs On Fire and included thirty-three days of Freedom Journal-focused interviews, blog posts, and emails. That meant for every day The Freedom Journal campaign was live, Kate and I were producing multiple pieces of content directly related to The Freedom Journal and setting and accomplishing goals so we could lead people to the Kickstarter campaign. The interest campaign that helped me gain proof of concept proved to be an incredibly valuable asset during this phase, as it gave me a direct connection to those who had raised their hand and let me know they were interested. I wanted to make sure those who had expressed early interest were on this journey with me in real time—not just on the outside looking in. In order to accomplish this, I sent out live updates around key milestones throughout our project and shared a ton of behind-the-scenes content around how the team was making it all happen. “From success to significance” is a saying I’m very passionate about, and The Freedom Journal launch was a perfect time to put it into practice. 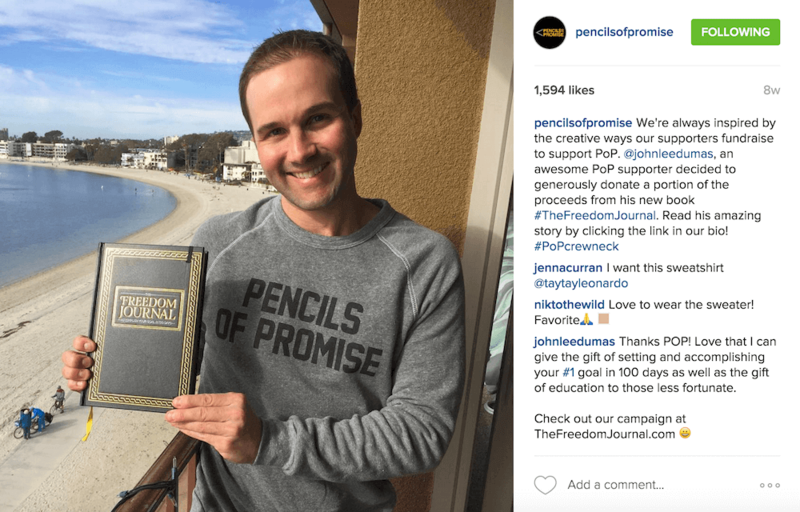 Pencils of Promise (PoP) is an organization that helps build schools in developing countries, and I decided to partner with PoP in a special way. For every funding goal hit during our Kickstarter campaign, I personally donated $25k to PoP, which is the cost to build a school. This partnership allowed backers to not only feel great about giving themselves the gift of The Freedom Journal, but also about helping give the gift of education to those less fortunate. Throughout the Kickstarter campaign I knew I wanted to run ads on social media in addition to our regular promotional efforts on platforms like Facebook, Instagram, Twitter, and LinkedIn. I chose Facebook as my main paid advertising channel because I felt that would give the highest return on investment (ROI). I ran Facebook ads every day The Freedom Journal campaign was live on Kickstarter. The total ad spend was $3,036, and the conversions from those ads resulted in over $17,000 for the campaign! 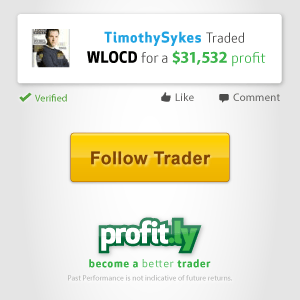 That’s a 490 percent ROI! The marketing strategy my team put together and executed resulted in a huge push. Remember, the more places you can be found—especially during your launch—the better. All of this content being sent out, shared, and consumed over those thirty-three days kept us top of mind and visible in A LOT of different places. Now that you have your marketing plan together, it’s time to focus on making your launch day an EVENT. For us, that meant hosting an in-person launch party in San Diego, where we invited friends, family members, and followers to join us in celebrating the launch of The Freedom Journal. The launch party not only generated added excitement around The Freedom Journal going live, it also gave us the opportunity to connect with some of our biggest fans and share the physical Journal with them. John Lee Dumas/Kate Erickson launch their Freedom Journal in San Diego, CA at Co-mmunity Shared Workspace. Photo credit: Paul Gero. This was a huge benefit for those who attended because they were the first to receive a physical copy of The Freedom Journal if they pledged at a certain level. This “open pledge” strategy at the launch party resulted in dozens of additional pledges, along with multiple up-pledges. Once you make sure your launch day is an event, you then have to be prepared to keep your momentum going strong throughout your campaign. Otherwise, it could fizzle out fast. Successfully keeping your momentum going is not easy; it will require a lot of creativity and time. But I can assure you (and I speak from personal experience) that much of the overall success of The Freedom Journal had to do with my dedication to Kickstarter communications and pushes throughout. One strategy I used to keep the momentum going strong during The Freedom Journal campaign: The “Up Pledge” strategy. The “Up Pledge” strategy is just what it sounds like: I leveraged the access Kickstarter gave me to those who had already pledged to the campaign and gave them incentives if they upped their pledge. For example, I might email every backer who already pledged at the one or two-pack level and tell them if they up their pledge within the next twenty-four hours to a four-pack, then I would send them a fifth copy of The Freedom Journal, for free, on the same day. This strategy as a whole resulted in over 413 backers upping their pledges! Another strategy I used throughout the campaign was introducing new pledge levels based on brainstorming sessions with my team and the feedback I was receiving from visitors (what people were emailing and asking me for that wasn’t already available). I introduced a total of four new pledge levels during the campaign, and these four levels ended up bringing in an additional $33,000 in pledges. Sometimes small tweaks can make a big difference! Anyone who is familiar with Kickstarter will tell you that the very beginning of a campaign and the very end of a campaign are the most important parts. This is where you either have added excitement or added urgency for people to take action. So, as your campaign is coming to an end, think about ways you can leverage that urgency to get an even wider reach and more eyes on your campaign. 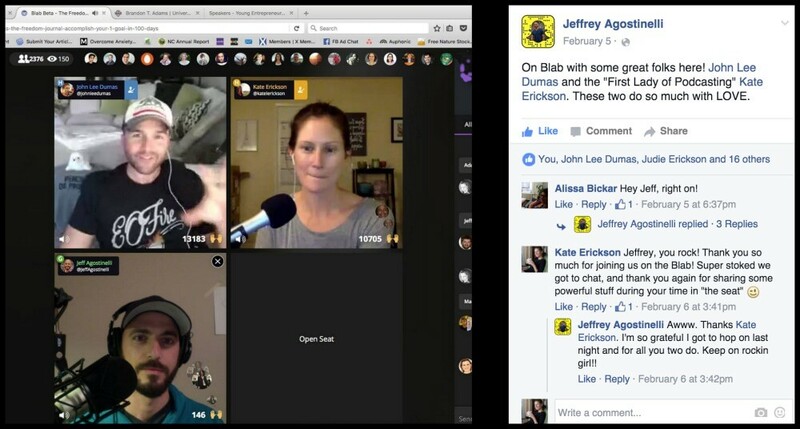 For us, that was celebrating the final three hours of The Freedom Journal campaign with a worldwide audience on live stream. The simplest way to do this would be starting a Facebook Live, and inviting people to join you so they can ask questions and chat about what has happened during the course of the campaign. You’ve not only made it to the end of this guide, but you’ve also just learned exactly what it takes to go from idea to launch on Kickstarter. Take a few minutes to visualize yourself at the end of your Kickstarter campaign, just having poured your blood, sweat and tears into an incredible project that now has a worldwide reach. Hopefully you’re now onto the fulfillment stage, which is when you’ll figure out how to get your product created, perfected, and shipped to your backers! Your journey has only just begun, and I can assure you it’s not only going to be an exciting one, it’ll also change your life. Launching The Freedom Journal on Kickstarter definitely changed my life, and it’s one of the best decisions I’ve ever made. It’s one of the best decisions I’ve ever made because it has created the exact ripple effect I visualized when I was just starting my project. Since launch, countless individuals have reached out to me and shared that they found me and The Freedom Journal through Kickstarter. They took a leap of faith. Even though they didn’t know who I was, they chose to back the campaign. Now, they’ve gone on to accomplish their #1 goal in 100 days. Our Freedom and Mastery Journal Facebook group has nearly 9,000 individuals who are sharing their journey with one another every single day. Minutes away from folding up shop and giving up on her entrepreneurial dreams, Elizabeth jumped on Kickstarter to research some successful projects to see if her idea might make it. During her research, she came across The Freedom Journal. Skeptical and apprehensive, she clicked the pledge button. A month later, The Freedom Journal arrived on Elizabeth’s doorstep, and over the next 100 days she used her Freedom Journal to set and accomplish her #1 goal of launching her own Kickstarter campaign. 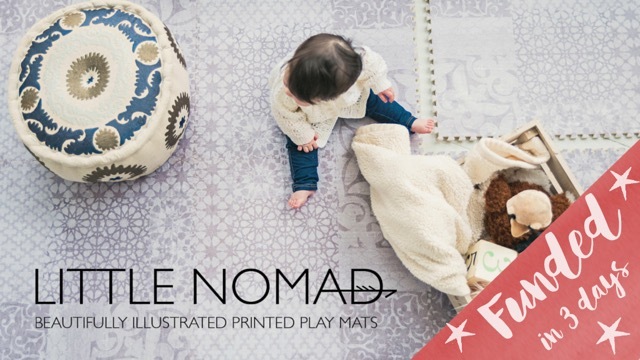 Elizabeth’s campaign for Little Nomad was funded in just three days. You can check out Elizabeth’s full story here, or listen to her tell it herself on the Entrepreneurs On Fire podcast. Our launch of The Freedom Journal on Kickstarter went far beyond what I ever could have imagined, and that’s the beauty of it. You can either spend a lot of time wondering what might happen if you actually launch your idea, or you can follow the proven steps I’ve shared here and just LAUNCH IT! I decided to believe in my idea and trust the process, and because I just launched it, I’ve now had the amazing opportunity to impact tens of thousands of people worldwide. 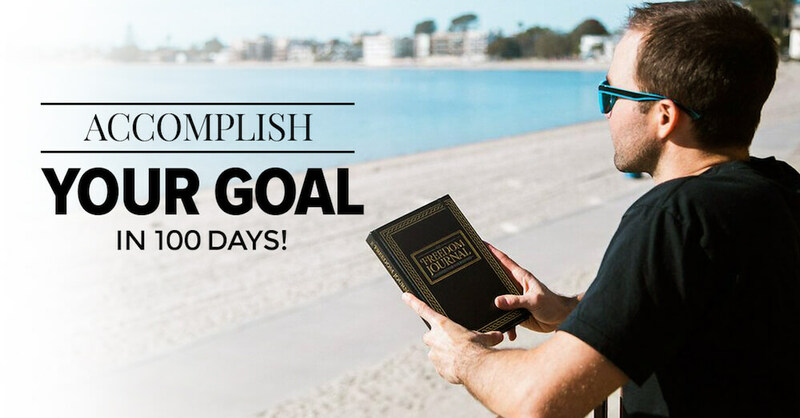 Ready to set and accomplish your #1 goal in 100 days? Check out The Freedom Journal today and use promo code “PAT” for a special SPI discount. Whenever I travel anywhere, I bring my laptop, and on my laptop there’s a laptop cover that everyone seems to ask about. It comes from Brik Book, and it’s a LEGO-compatible cover. It’s awesome. How Much Money Does It Take to Start an Online Business?—UPDATED! The post SPI 223: Over the Shoulder—How John Lee Dumas Launched a Successful Kickstarter Campaign from The Smart Passive Income Blog. The post SPI 217: Brik Book and How Brett Miller Quit His 6-Figure Job to Build LEGOs from The Smart Passive Income Blog.